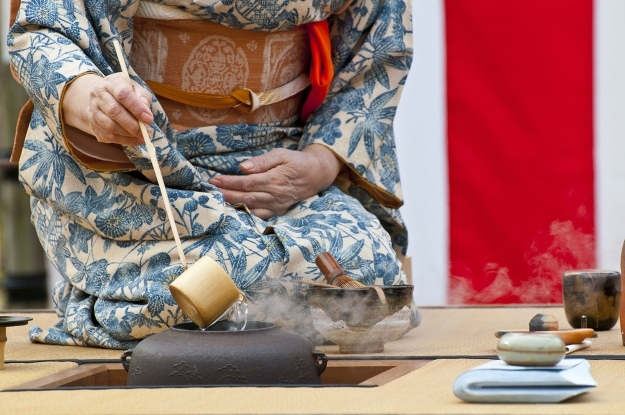 The tea ceremony, chado in Japanese or the ‘way of tea’ is a must-do experience on your holidays to Japan. This ritual preparation and presentation of matcha green tea is the perfect snapshot of traditional Japanese culture and gives visitors a glimpse at the philosophies and customs that have flourished in Japan over hundreds of years. Full of choreographed movement and symbolism, it can be easy to miss what’s going on, so we’ve put together this handy guide to steer you through. The history of the tea ceremony is, of course, closely linked with Japan’s relationship with magical brew that is tea. It arrived in Japan from China in the 7th century and was at first drunk for medicinal purposes, then for religious ones, potentially used by monks to stay awake through long periods of mediation. By the 13th century the upper echelons of Japanese society were throwing elaborate tea parties and Samurai were drinking it as part of their preparations for battle but by the 16th it was a popular beverage amongst all levels of society. It was tea masters Murata Juko and Sen no Rikyu who added the philosophical and ritual elements to tea drinking to create the tea ceremony, and it’s been practiced precisely this way ever since. Chado is one of the three classical arts of refinement, alongside kodo (incense appreciation) and kado (flower arrangement). It embodies the principles of Zen Buddhism and is a spiritual process, allowing guests to take time to reflect and look for inner peace. There are formal (chaji) and informal (chakai) versions of the ceremony; in both, the tea is prepared with the same reverence. The chaji tea ceremony was developed by Sen Rikyu to entertain the Shogun and feudal lords of old Japan, and so is an exclusive and sophisticated experience. It is hosted for three or four select guests only and involves kaiseki, a traditional feast, servings of thick (highest quality) and thin tea and confections and can last up to 4 hours. A chakai tea ceremony is much more inclusive; anyone is welcome to drink thin tea and sweets, and there are usually several servings. This is the sort of ceremony you will experience on one of our tours, such as Discover Japan. Hosting a tea ceremony is an art, and the host will usually be a master, having learnt the choreographed movements and studied art and philosophy to help truly appreciate the role. It is also the host’s role to make the tea ceremony experience completely unique and do whatever they can to please their guests. While the tea room will be very simply decorated, the host will choose a hanging scroll or a flower arrangement to complement the season or occasion, will choose ceramics for each guest that reflects their characters, and will select their tea tools especially for the occasion. 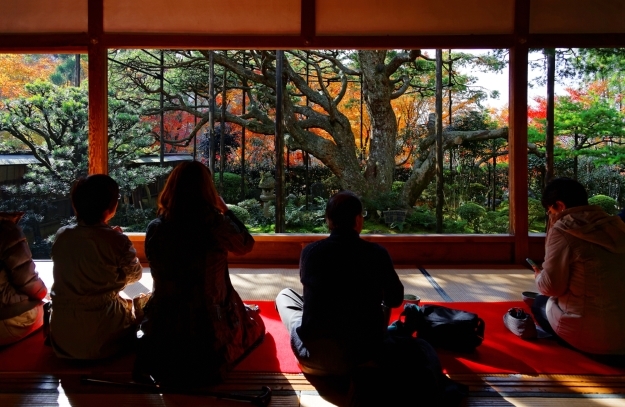 The tea ceremony takes place in a simply decorated tatami mat room, or outside surrounded by nature. The host would have risen early to begin their preparations and to set up the tea ceremony space. Guests arrive and prepare themselves by cleansing their hands and their mouths to symbolically wash away the dust of the outside world. All tearooms are entered by a low door meaning each guest must bow in respect as they step inside. The door also symbolises a leaving behind of the outside world, and is seen as an equaliser, making everyone inside of equal status. All guests kneel on a cushion whilst the host cleans their tools with choreographed, elegant movements. Purified water is boiled in an iron kettle on a stove set into the floor. A silk cloth, taken from the host’s kimono sash is ceremonially inspected, folded and unfolded before being used to remove the iron kettle from the stove. The matcha tea powder and some hot water are then added to the bowl and whisked with a bamboo whisk. The room at this point is respectfully reflective and attentive to the host’s activities. The prepared bowl of matcha tea is handed by the host to the first guest with a bow exchanged between the two. The first guest rotates to bowl in two turns so as not to drink from the decorative front of the bowl. The rim of the bowl is then wiped and passed on to the next guest with a bow, who will rotate it a quarter turn before sipping. 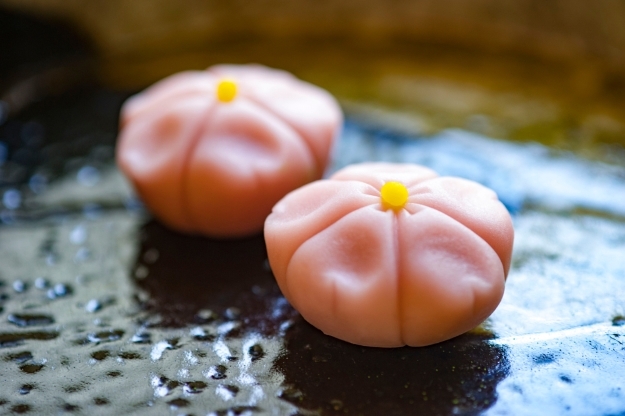 Wagashi sweets are also served to offset the bitterness of the tea. Once each guest has sipped from the bowl, it is handed back to the host who will cleanse it and the tools before bringing the ceremony to a close. 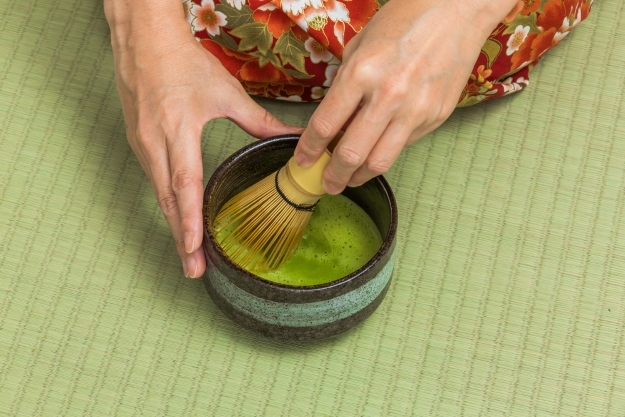 You can enjoy a tea ceremony pretty much anywhere in Japan, but the most popular place to experience one is in the ancient capital, Kyoto, where the tea ceremony was born. 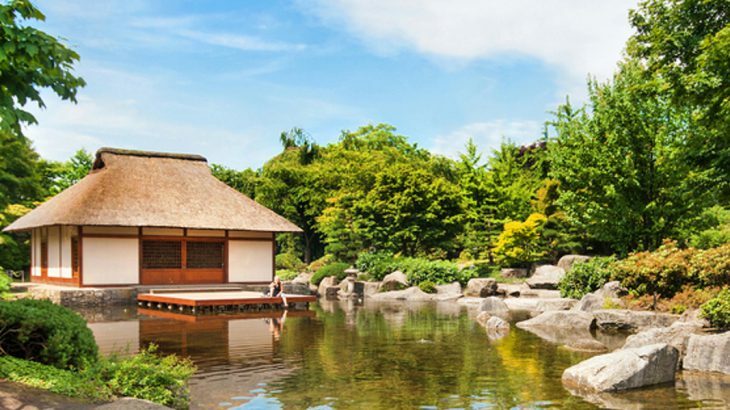 On all of our Japan group tours, you will take part in a tea ceremony in Kyoto, either in a traditional tea house set in classically landscaped gardens, at a peaceful Zen Buddhist temple or a beautifully-restored wooden townhouse. During the ceremony, you’ll learn about the background of the ceremony and the importance of tea, before tasting the tea and wagashi sweets. As well as giving you the opportunity to embrace something utterly Japanese in spirit, it’s also a welcome moment of calm to reflect on your explorations of a unique and magical land. Japan culture, food and drink, history, top things to see. permalink.